Gene Ramsey was sworn in Tuesday as Blaine County's new sheriff, following a unanimous vote Monday night by the Blaine County commissioners. "Basically, I guess I've been in training as sheriff for the last 33 years," said Ramsey, referring to his 33-year tenure as the county's chief deputy under three different sheriffs. Ramsey's appointment ends speculation about who would replace former Sheriff Walt Femling, whose resignation, announced for health reasons in early January, became effective Tuesday. Some people have suggested that Ramsey was an automatic replacement for Femling, but Commissioner Tom Bowman said that he didn't make up his mind until Monday night. Commission Chair Angenie McCleary said Ramsey wasn't her top choice, but said she would not oppose his appointment, which was favored by Bowman and Commissioner Larry Schoen. The commission vote came at the end of a public meeting at the Old Blaine County Courthouse, where Ramsey and two other candidates answered more than a dozen questions from the commissioners concerning qualifications, experience, knowledge of Blaine County and the future of the department. The commissioners originally planned to interview the candidates in public and then convene into executive session to deliberate. However, McCleary said Monday afternoon that the commissioners had since learned that state law required them to conduct the entire process in public. The other candidates were former Texas lawman Phil English, who has lived in Blaine County the past two years, and Hailey police Patrolman Larry Clark, who has been a policeman in the Wood River Valley for eight years following a 20-year career in the Navy. 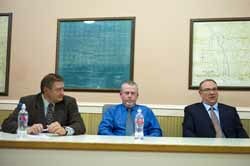 The three candidates were selected by the Blaine County Republican Central Committee, which under state law had the task of providing a list of three potential candidates to the commissioners because Femling was elected as a Republican. Eight people applied to the GOP committee for the appointment. "They made our job a lot more difficult by the quality of the candidates they put before us," Bowman said. Schoen said he was pleased with all the candidates, but called Ramsey "the most qualified candidate for this position." "I think Gene most of all knows how the Sheriff's Office fits into the local community and has the best understanding of the office and what needs to be done," he said. "I feel right now that it's almost my duty to appoint Gene Ramsey sheriff for the next two years." Schoen said Ramsey "stepped in very ably for Walt during his illness." "I think he's had a huge imprint on the success of that office," he said. The next election for sheriff is in 2012, and Ramsey told the commissioners he plans to run for the office. "I think if you get a free shot at it once, you need to try to get elected," he said. Bowman said he favored Ramsey for the appointment partly to avoid disruption at the Sheriff's Office. "I think the thing that most affects me is that one of you will be sheriff tomorrow—there's no transition," Bowman said. "There would be a steep learning curve." McCleary said her preferred candidate was English, because of his demeanor and experience. "It would be a very close decision for me, but I will support the board if that's where you want to vote," McCleary said. "I would not oppose Gene as sheriff." A large group of Sheriff's Office employees attending the meeting seemed pleased with the commissioners' decision, making quiet but audible sighs of relief when Ramsey emerged as the winner. Femling, who attended Monday night's meeting, finally let the cat of the bag and told the Idaho Mountain Express that he endorsed Ramsey as his replacement. "I have always been 100 percent behind Gene—he deserves it 100 percent," he said in a brief interview during a meeting break before the commissioners voted. "I've made it known to the selection committee and I've made it known to the commissioners and to all the people who have talked to me or sent me e-mails."